The botanical name of Haritaki is Terminalia chebula. Haritaki is one of the most important herbs from Ayurveda. Due to a variety of Terminalia chebula benefits, it is also called as “The King of Herbs’. Haritaki is extremely useful for detoxification and supporting healthy digestion. Its nutrient quotient may contain quinic acid, oleic acid, stearic acid, and tannic acid. 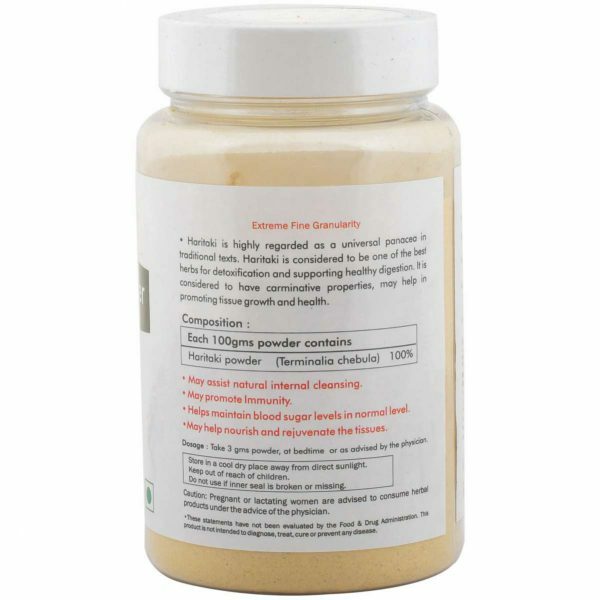 Terminalia chebula may help in internal cleansing, may aid in removing the toxins from the body. Moreover, Terminalia chebula uses may include cleansing the wounds and injury, eventually preventing the infections. Additionally, haritaki may contain vitamin C, tannins and arachidic acid which may support healthy digestion and constipation relief. It is known to be a good bowel stimulant. Additional Terminalia chebula benefits include being adaptogenic, antifungal and antioxidant in nature. Moreover, it may possess purgative, rejuvenating, nervine, nutritive, stomachic and antiviral properties. Terminalia chebula uses in maintaining healthy levels of sugar are valuable. It may help in better processing of glucose and may keep the sugar level in check. Due to these benefits, it may also be useful in heart conditions. Haritaki powder may also help in eye care. It may reduce eye dryness, may help in eye infections and may also fight conjunctivitis. 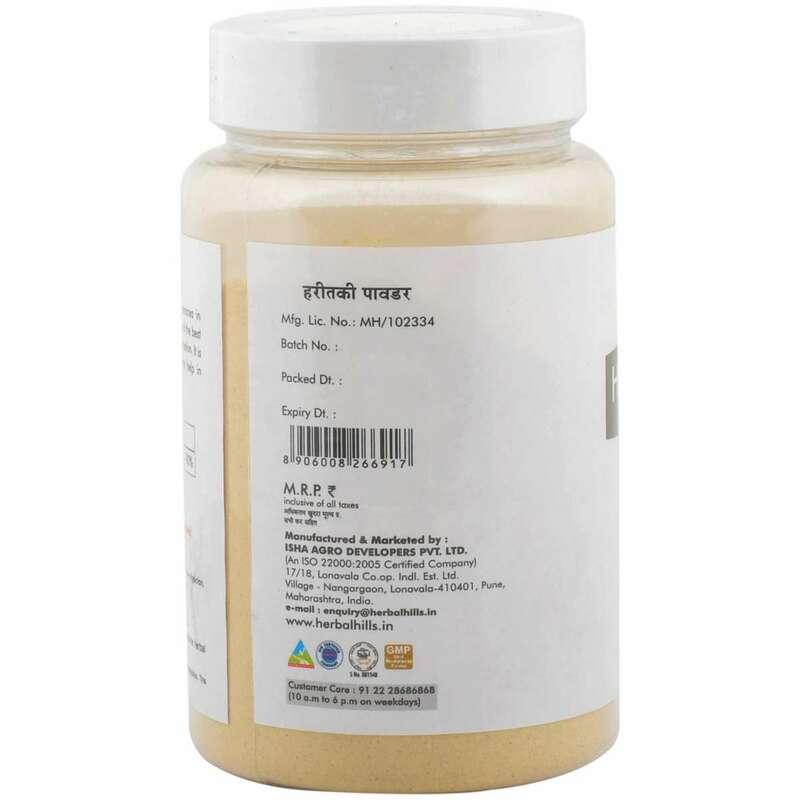 Haritaki has been used as an anti-aging herb for centuries in India. Also, it may promote skin care and keeps the freshness of skin intact. It’s important to have healthy cell care in today’s rapidly changing lifestyle. Terminalia chebula, due to its antibacterial property, may provide huge relief on this front. According to some studies, haritaki may have beneficial healing effects on kidney and pancreas. Due to so many vital Terminalia chebula uses, it is always in high demand. 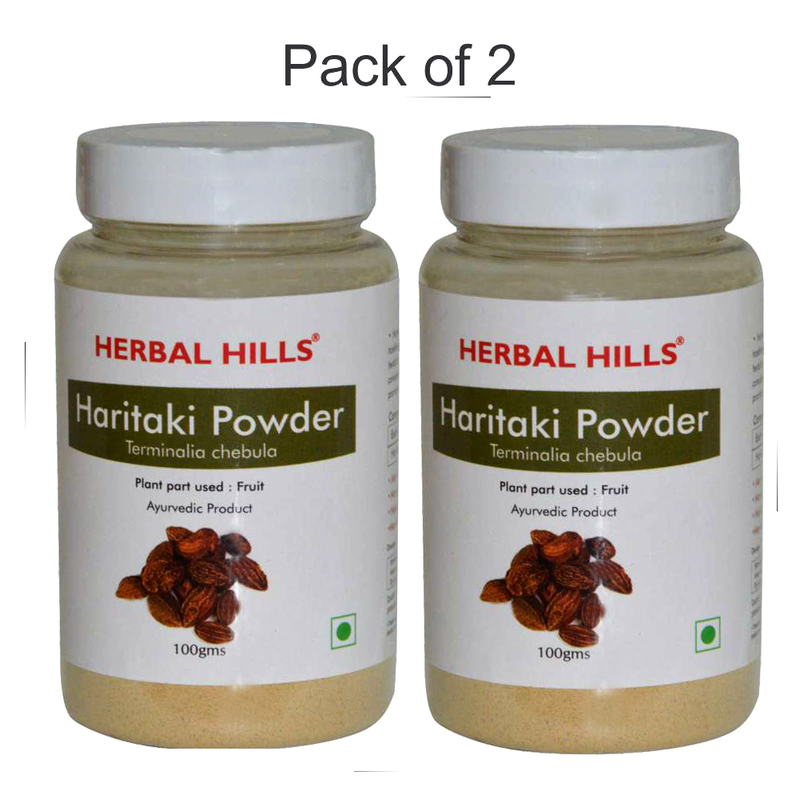 Herbal Hills produces Haritaki Powder with the help of modern and highly advanced technologies. It is one of India’s leading and most trusted brands to buy Haritaki online. A team of experts, with decades of experience in Ayurveda, creates these herbs in the facility which has ISO, GMP, and Halal certifications. Buy the powder of haritaki online. It is a fast and 100% reliable source. Please consult your physician for the exact dosage. Also, let us know of your experience of using the product.